As a regular on the world festival circuit, where have you performed? Over the years, I’ve toured to 25-30 countries, performing at venues and festivals ranging from grungy fringes to fancy arts and from contemporary music to comedy. Connecting with other ways of functioning improves my adaptability and opens my mind to other ways of working that I might have never thought of before. We’re also coming to Edinburgh this year to sell the show for touring in 2019-20. Do you think the rough and ready infrastructure of a fringe is a problem for performers? I don’t think having less sophisticated spaces and basic technical support is intrinsically problematic – in fact it can lead to a more colourful experience, giving companies with fewer means the possibility to put on a show, but the motivation behind why the venue exists and how transparently it communicates what they provide matters a great deal. How were the shows before you played Edinburgh? 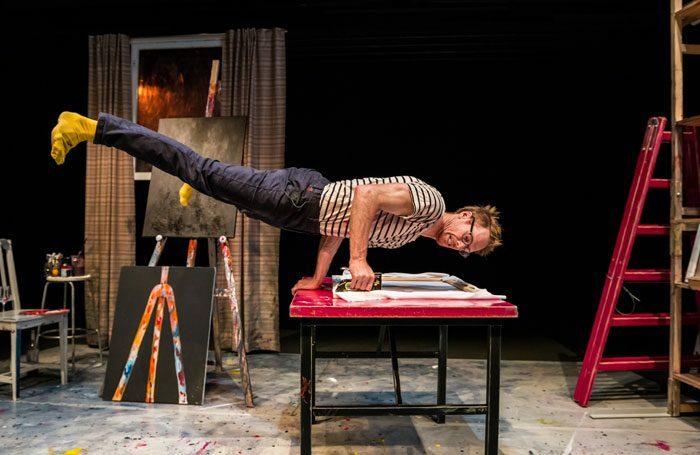 The Artist is a physical comedy that looks at what goes on before the final result of an artwork. It’s about one of the most common questions artists are asked: ‘What is your inspiration?’ It has toured Finland and the Czech Republic. The response was similarly positive in both countries and across the various cities and towns. We were surprised at how enthusiastic the audience was and that we sold out in a small town on the outskirts of Helsinki. I’m looking forward to taking the show to New Zealand at some point. How does your experience of festivals compare with those in Finland and New Zealand? Festivals in Finland and New Zealand resemble their respective geographies. Finland is quite consistent but New Zealand can vary dramatically. The audience members’ age, their response, the turnout, and the functionality of the festival is relatively consistent in Finland. All those factors seem to chop and change depending on where you are in New Zealand. In both countries the festivals are generally well-run and technically reach a good standard. I feel like things are changing quite rapidly, especially for comedy-based work. Audiences in Finland, which have a reputation for being reserved, can be surprisingly expressive, and I find that increasingly to be the case. I also find Finnish audiences are particularly patient and focused which is a nice quality to perform to. In New Zealand, the audiences tend to be pretty enthusiastic and up for a good time. Entertaining and comedic work is really fun to perform, while audiences can sometimes find it more difficult to accept work that leans towards the experimental side of theatre. How will Edinburgh will help your career progress? I think the show will sell to some festivals and gather some momentum to sustain it for a number of years. Oddly enough, but almost universally so, having affirmation of success elsewhere is almost essential to being accepted as a success at home. In New Zealand, Edinburgh is a noteworthy badge to wear, in Finland my impression is that programmers aren’t so fussed. Maybe there are too many superlatives floating around for the Finns to take it seriously.